Yesterday the two custom oak windows were installed. Both are in the kitchen/lounge – this is a tall thin one and a large square one. The smaller one arrived on site fully glazed. The larger one had to come unglazed as it would have weighed too much fully glazed. 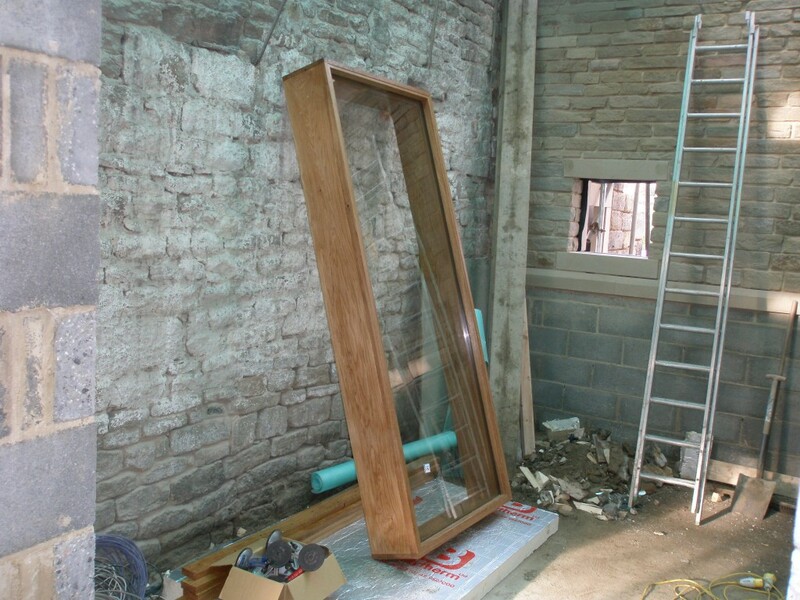 The oak frame itself is around 80kgs and the glass is around 150kgs. The glass is so heavy because of its size and thickness. There are two panes of glass each 8mm thick. 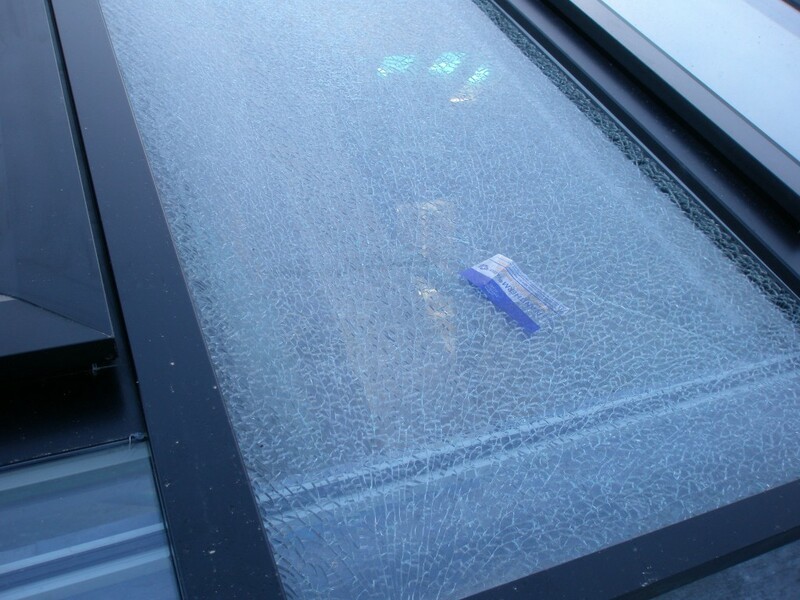 This has too be toughened safety glass as the window runs from floor to ceiling. The frame itself is a really chunky piece of oak. The glazing beads (the strips of wood that hold the glass in place) are massive when compared to normal beads. While the smaller window would go through the back door in the boot room, the large oak frame had to be carried across the bottom field, into the sunken garden and then through the opening for the bi-folding doors in the lounge. It is difficult to get a good photo of both of these windows are the moment because of the scaffolding being in the way. However, this will be coming down next week just in time for the bi-folding doors to be fitted. This is the smaller of the two oak frame windows. This one arrived on site fully glazed. The wide part of the frame sits on the outside of the building. This is difficult to see at the moment because of all of the scaffolding, but the smaller of the two oak windows has been installed. 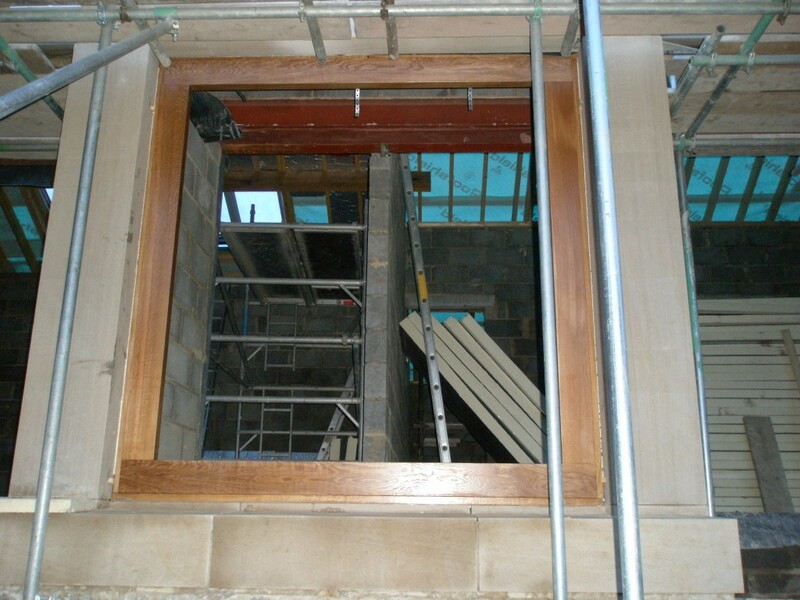 This oak frame weighs about 80kgs and will only go in via the large openings for the bi-folding doors. It will be glazed on Monday. The glass is onsite already, but weighs a further 150kgs. Hence the frame and glass have been installed separately. It is difficult to see clearly becuase the scaffolding is in the way, but this is a very large oak frame. 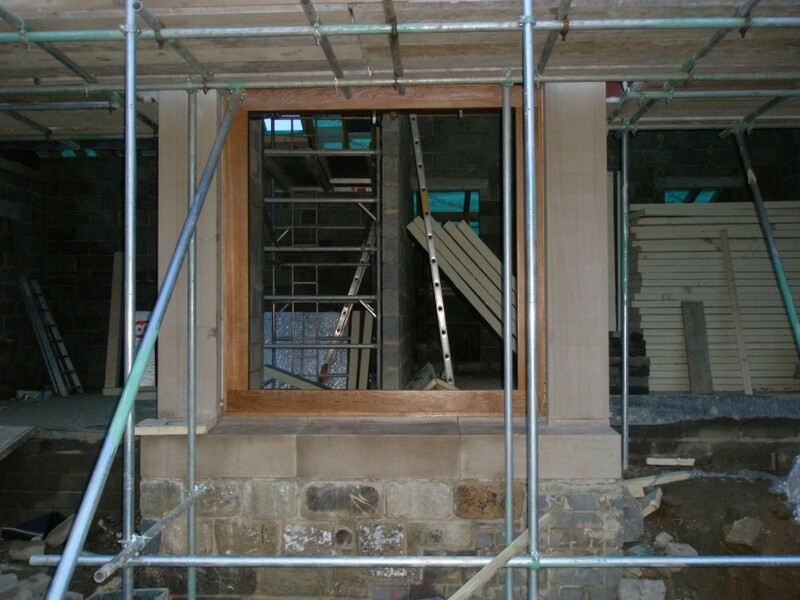 When Huddersfield Joinery brought it on site, it looked more like a piece of furniture than a window! We are getting ready for the second fix electrics. The new three-phase supply is due to be installed next week, so there is a lot of work to do. We need to put a three-phase distribution board in the extension and then connect this to a consumer unit in the older part of the building. This means that there are essentially two consumer units in the property enabling us to shut off the power separately in the two parts of the building. The plan is to get these consumer units in place for when the new power supply is connected. If we don’t do this, we won’t have any power next week. We are also installing the Loxone kit that will control the lighting, heating and some of the other features. There will be Loxone kit in both the new extension and the renovated part of the building. The mini-server will be installed in the renovated part and a number of extension modules will be installed in the extension. The Loxone kit is being housed in standard consumer units – there are relatively inexpensive and easy to source. This is still work in progress and I reckon we won’t have this powered up until the middle of next week. The new supply comes into a meter box on the opposite side of this wall. 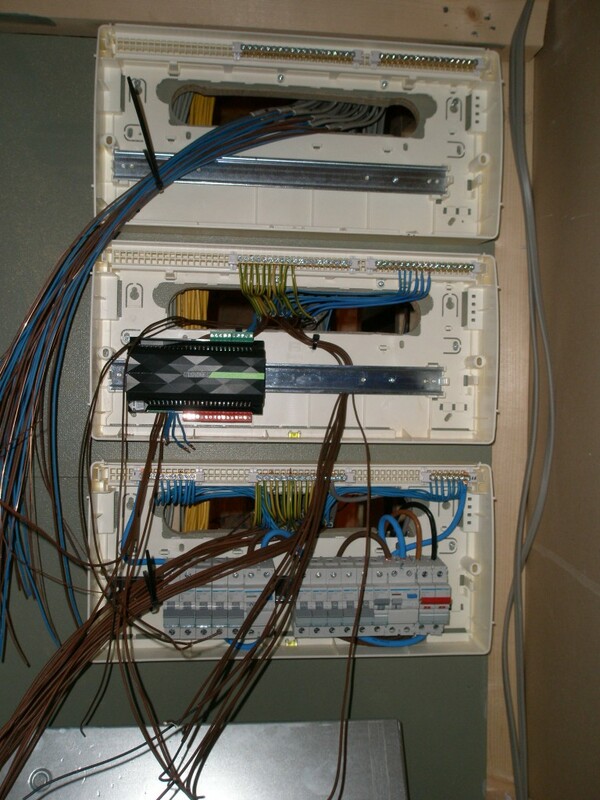 A cable will then come through the wall and feed this consumer unit. 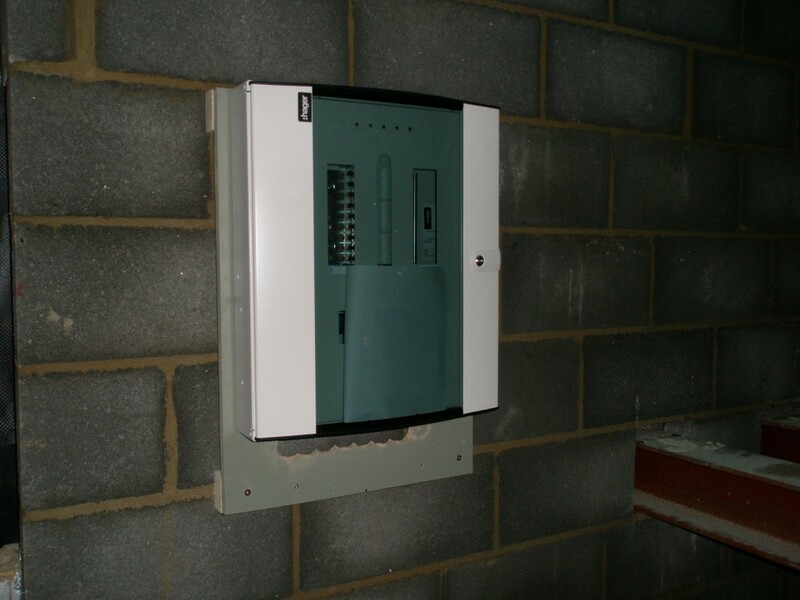 There is a feed from here to a second consumer unit in the renovated part of the property as well as a feed to the shed. The top two consumer untis will house the Loxone kit. The bottom unit houses the breakers and RCDs. 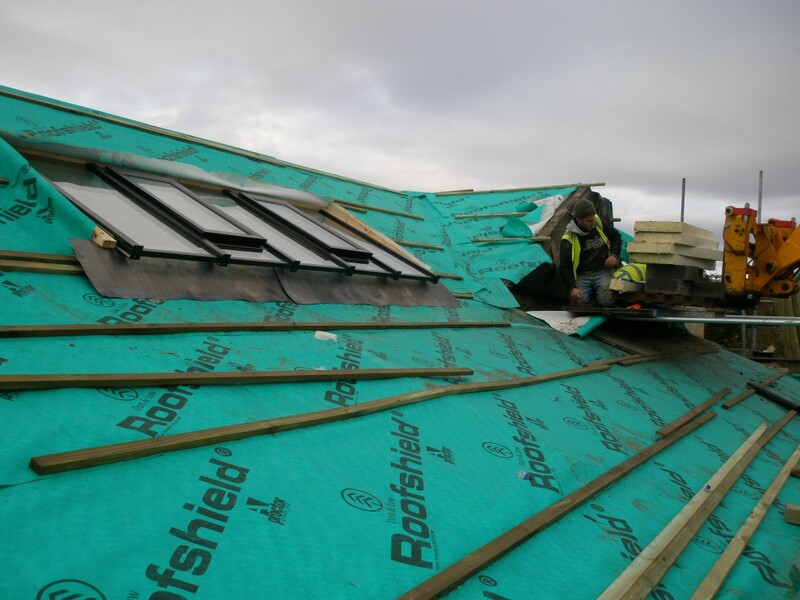 As well as the rooflights being installed today, the other windows were also installed. 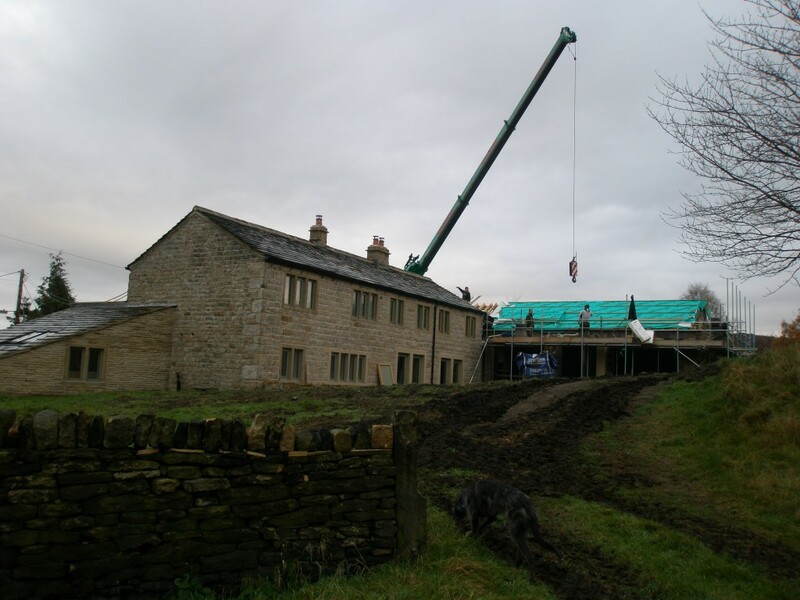 Huddersfield Joinery who produced the windows for the renovated part of the property, have also supplied the windows for the extension. There are around 9 new hardwood windows (painted the same green as before) and 2 large custom-built oak windows. The green hardwood windows went in today. The oak windows will go in tomorrow. There has been a minor blimp with two of the windows. Both of them in the kitchen. 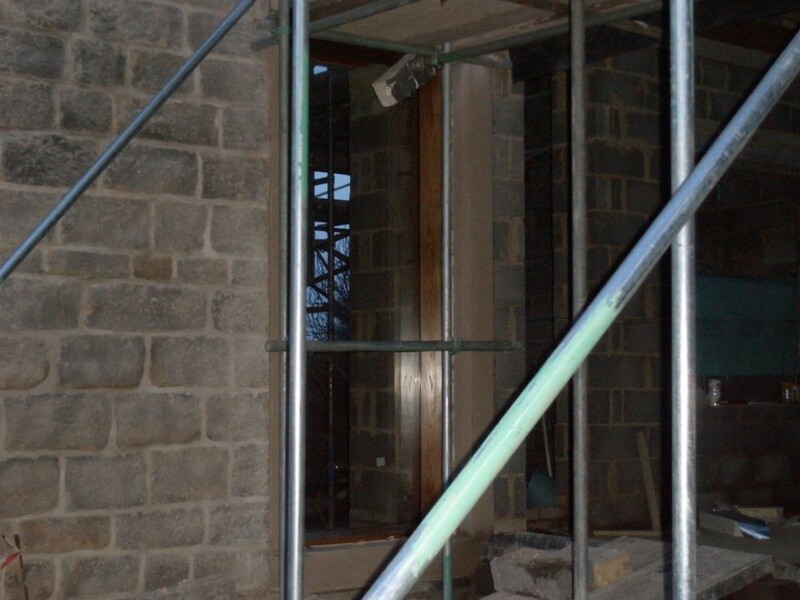 There is a large window that is too big – the architect revised the window schedule and no one told Huddersfield Joinery. I assumed that the architect had sent the revised drawings and the architects had assumed that I had sent them. When you project manage your own build, you need to be very careful over roles and responsibilities. This is a great example of what can go wrong. The other window was also too large. This time the ashlar schedule didn’t match the window schedule. The stone surround was specified as 600 x 600, but the window was specified as 600 x 650. We should have double checked that the two matched, but unfortunately this didn’t happen. When there are over 40 windows, each with their own stone surround, that is a lot of checking. The bottom line is that these two windows are going to have to be remade. And at our cost. The rooflights were installed today. There are three sets. Two in the lounge and one in the kitchen. Each set is identical. 5 panes 600mm wide. Originally, we were going to install 6 panes 500mm, but this increase the amount of frame in the unit and reduced the amount of glass. 5 panes 600mm wide was about the same price as 6 panes 500mm wide. Each set has two openers. These are electrically operated. The electrical unit has to be the ugliest thing ever. And the rocker switches that came with it are even worse! I am less worried by the switches as we will use the Loxone system to control the opening and closing of these windows. This means that when we set the alarm, the windows can be closed automatically. The motor units are more of a problem. I thought there were covers to go on them, but alas no – they are meant to look like this! 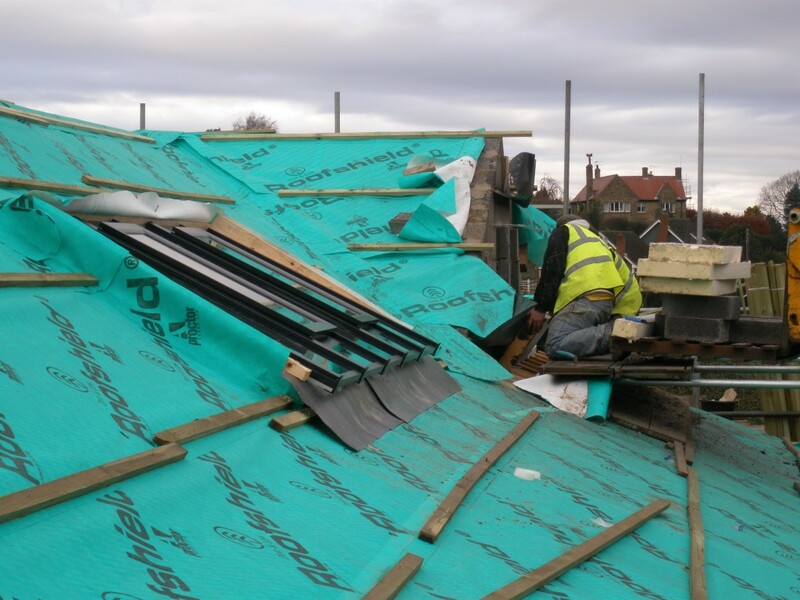 The installation was very quick – around 2 hours to get all three banks of rooflights installed. The frames and the glass are shipped separately and the team from Standard Patent Glazing assemble them on site. Unfortunately, one of the panes bumped into the scaffold when being brought into the extension. When it comes to glass versus scaffold, the scaffold is always going to win. 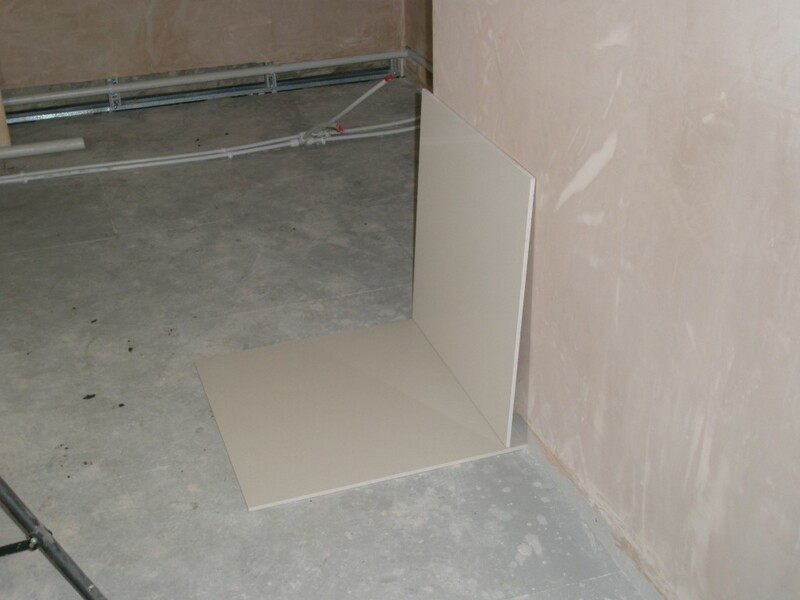 The broken unit has been fitted temporarily, but a new unit has been ordered and should be installed next week. There are three sets of rooflights in the extension. Two in the lounge and one set in the kitchen. 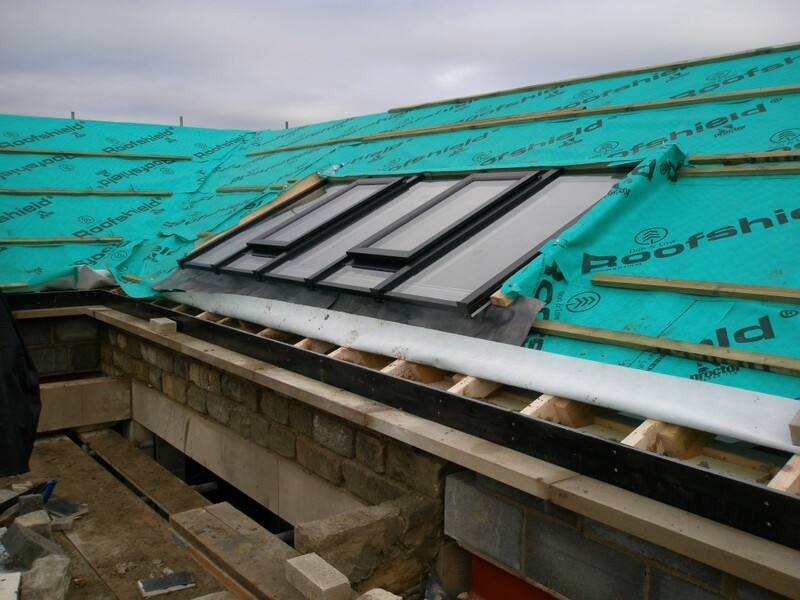 All have electrically operated opening panes – 2 in each set. This is the rooflight in the rear of the lounge. You can see the lead underneath the window. 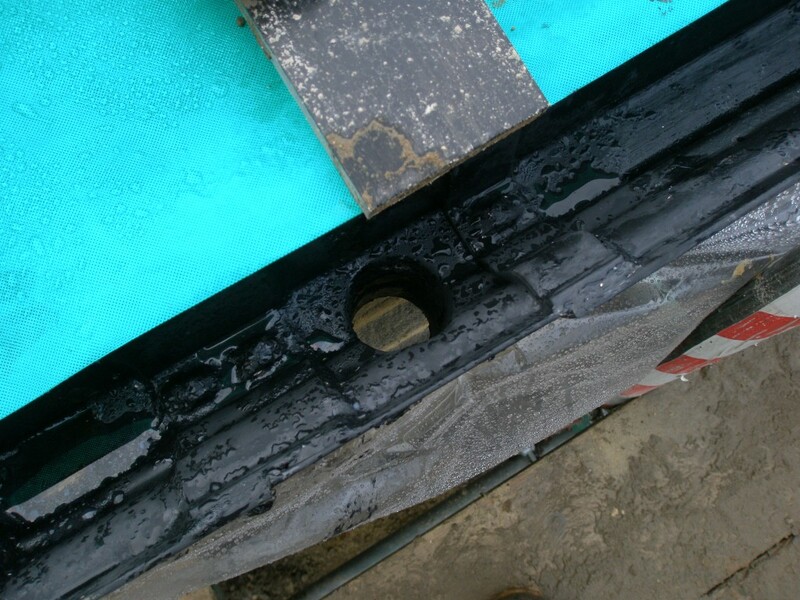 More lead will be fitted when the roof is slated – this is due to happen next week. These are the rooflights in the rear of the lounge. Nick and Dan are working on the stonework in the small gable in the end of the kitchen. This happened when the panes of glass were being carried in. One of them just caught the edge of a scaffolding pole. A replacement was already on order by the time the installers had left. It will be replaced next week (at their cost). We brought in a crane this morning to lift into place a large piece of ashlar. It was only with us for a couple of hours, but there was no other way to get the stone into position. It never ceases to amaze me how large these cranes are. This has to be the biggest one that we have used to date. We may need to use a crane to lift the stone into position of the steps in the garden, but that is a while away yet. 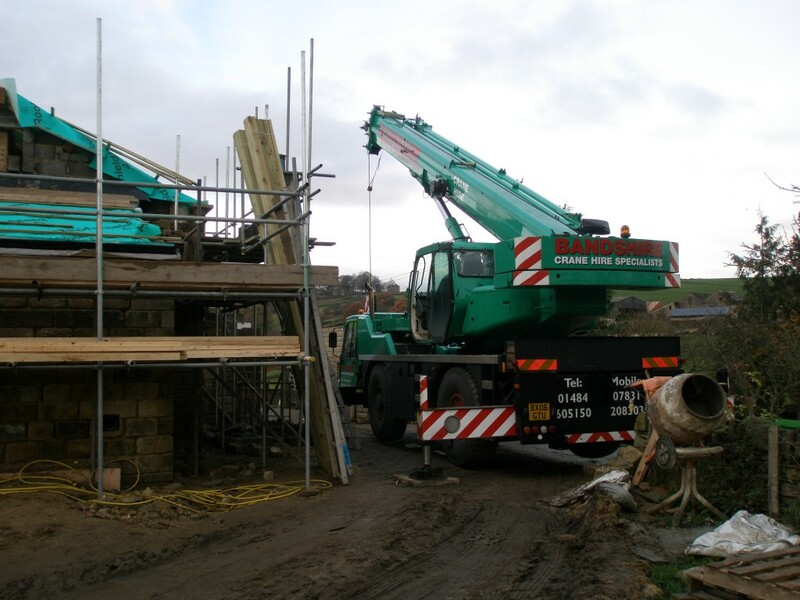 The easiest way of lifting the stone into position is to use a (very) large crane to reach over the house and pick up the stone that was already in the rear garden. Communication with the crane driver can be difficult, but this is achieved by Nicky standing on the roof and using hand signals with the driver. It only took a couple of hours. This is the piece of stone (or rather three pieces of stone bolted to a steel beam) that goes across the opening of the bi-folding doors in the lounge. It probably weighs around a tonne, so it isn’t possible to lift this one by hand. The most amazing thing about this crane is the fact that it actually fits on the drive! 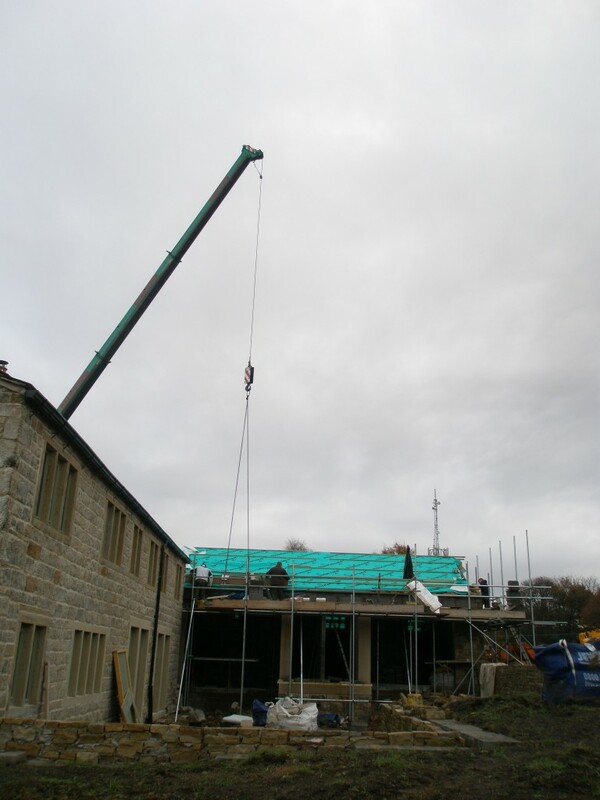 This is the largest crane that we have had on site during the renovation. I have just about finished the wall in the upper terrace in the sunken garden. There are just the coping stones to go on. These are being produced in a local quarry and with any luck should arrive this week. It will be good to get this wall finished. 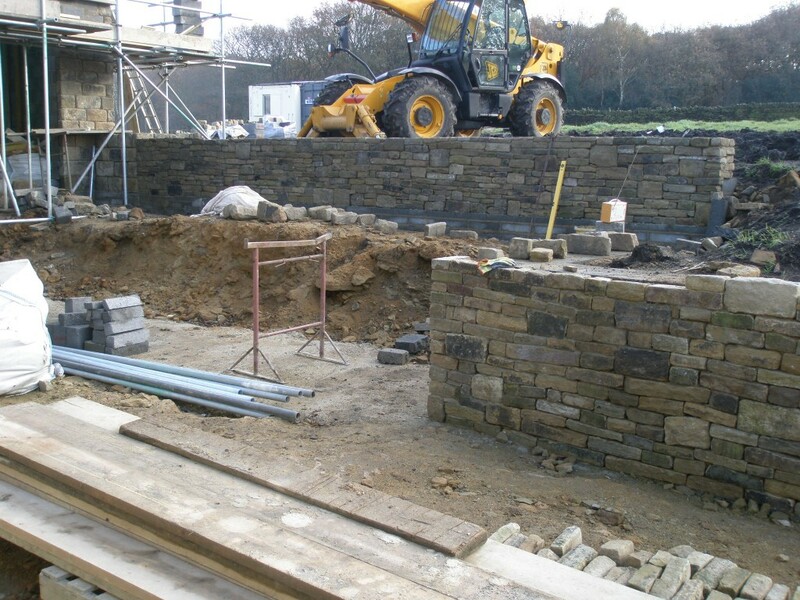 I still have the lower wall to complete and there is probably 2-3 days left on it before the coping stones can go on that too. With the weather closing in, it will be good to get on with the next task (insulating the rafters in the extension) which is an indoor job! 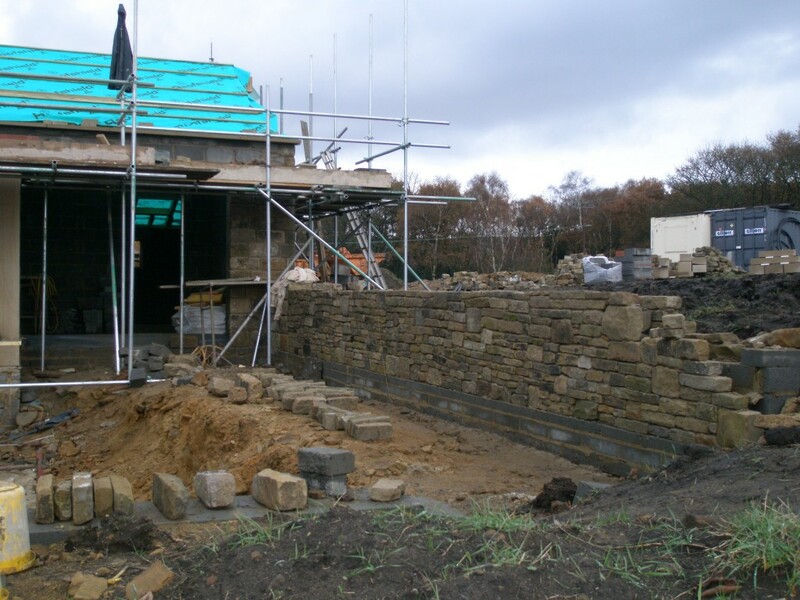 Despite some pretty wet and muddy conditions, the upper terrace wall is now ready for coping stones. There is a date stone for 1861 on part of the building. See this previous blog entry. We believe that the orignial building dates to around 1700 (or so), so this must have been when some renovation work was done. In the same spirit, we thought it would be a good idea to put a data stone on the new extension. 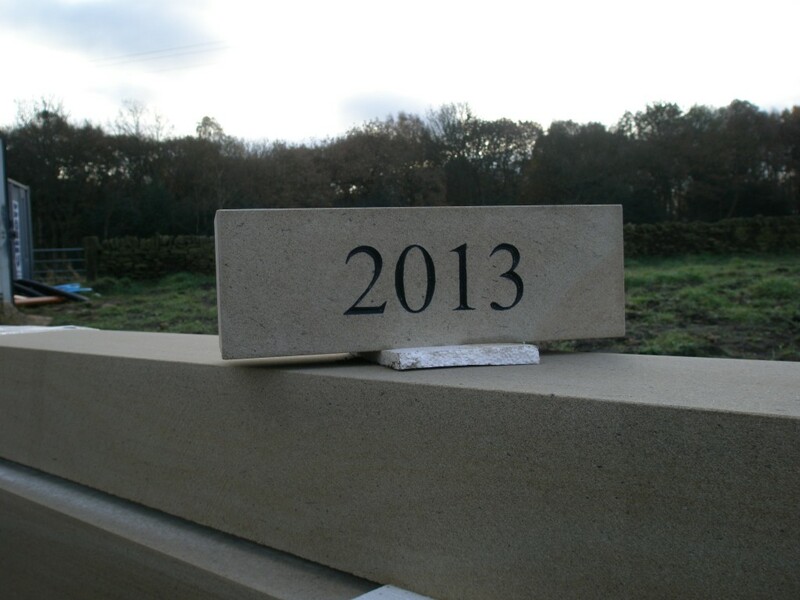 The date stone was produced at the same quarry we have been using for the rest of the ashlar in the new extension. It was sized so that it would fit in one of the upper courses of stone in the end gable. We wanted it to be low key and out of sight, but felt that it was important to follow in the same tradition as previous owners. The date stone was made at the same quarry as we acquire all of the ashlar for the extension. 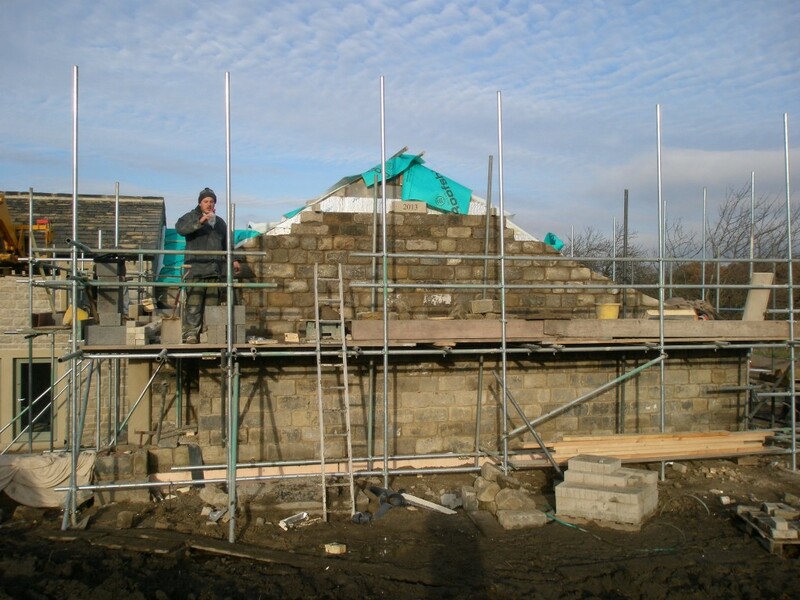 Matt finishing off the last few courses on the end gable – including the new date stone. 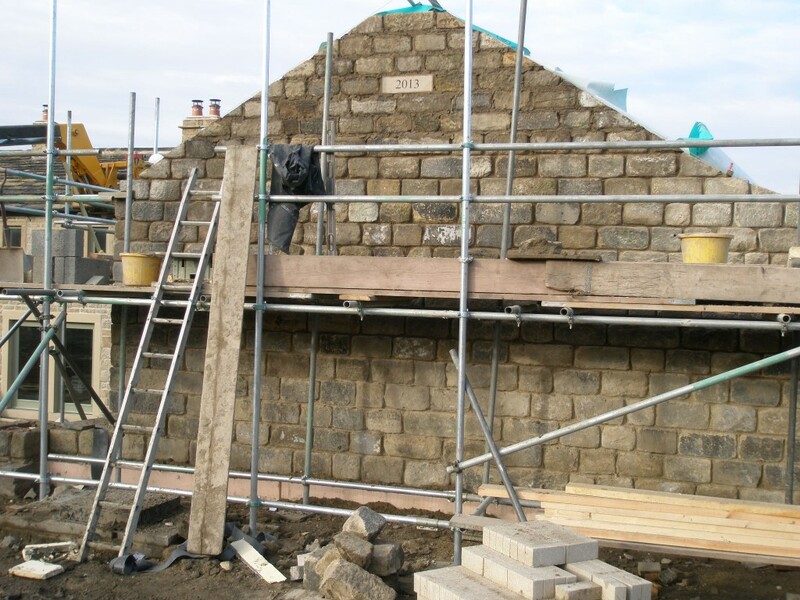 We have put the date stone on the end gable on the back of the extension. There is a date stone from 1861 on another part of the building. This isn’t when it was originally built, but when some major renovation work was done. I picked up the floor and wall tiles for the bathrooms in the old cottages last week. I only got around to looking at them today. It would appear that the tiles are slightly different colours. I took some photos from a number of different angles. I was hoping that it was a trick of the light. But it would appear not. I will have a look at them again in the morning. 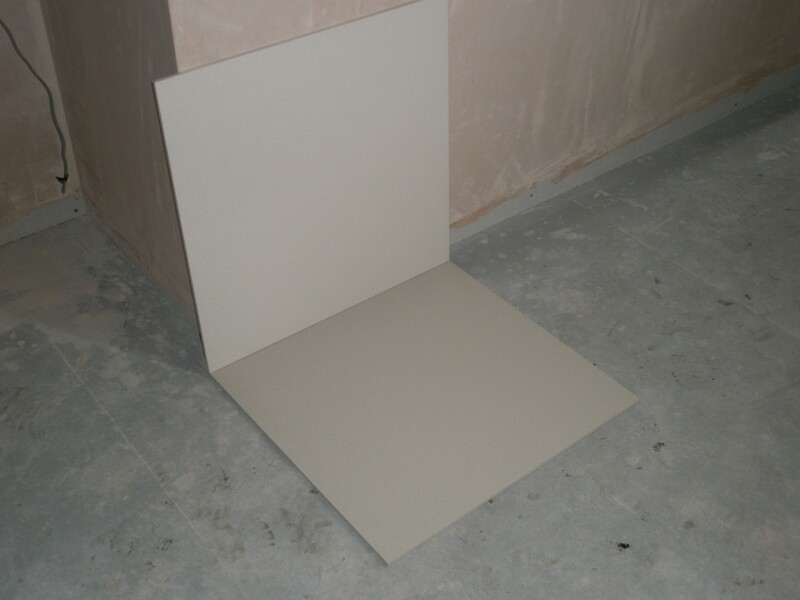 Mmmm….the floor tiles are a Matt finish and the polished tiles are for the walls. Unfortunately, they don’t match. Let’s take the photo from another direction and see if the tiles look better. Nope. They still don’t match. Maybe they will look better in the morning. We are installing cast iron gutters on the new extension just as we did on the renovated cottages. The gutters here sit on an ashlar “shelf”. The ashlar shelf has a groove underneath to stop water running back towards the building. 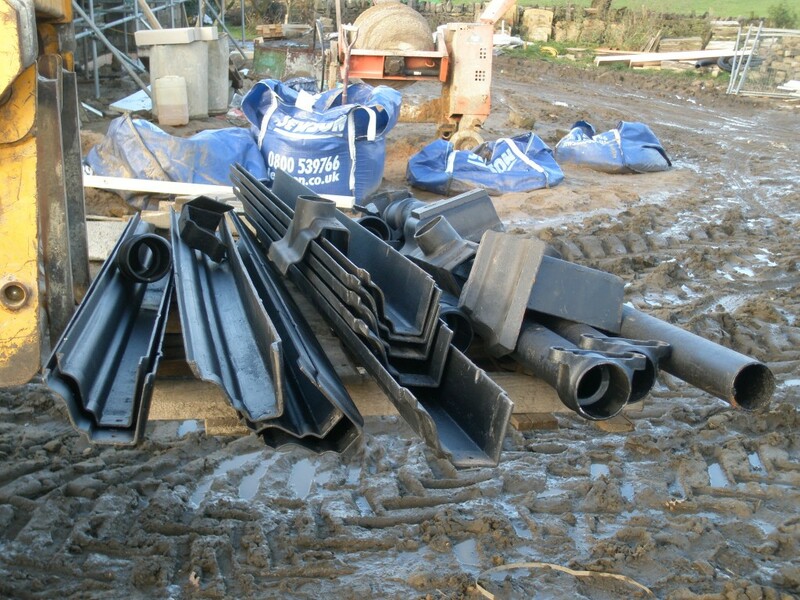 As before, the gutters came from the Longbottom Foundry in Holmfirth. The gutters are pattern 46 (so called because it was the 46th pattern that the foundry made for gutters). We are using 6×4 on the front (where the elevation is high) and 5×4 on the back (where the elevation is lower). The gutters have to be assmbled for the entire length and then slide onto the ashlar shelf. This is awkward, but doable. We have put plastic underneath the gutters to protect the ashlar while the gutters get a final coat of paint before being slid into postion. Holes are core drilled in the ashlar to accomodate the down pipes. We are putting up cast iron gutters on the extension. 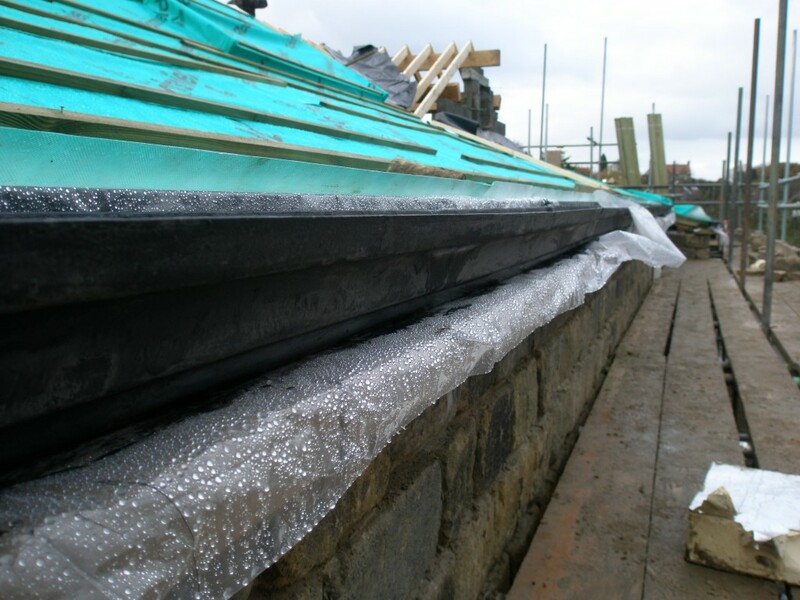 We are using the same gutters as used previously, however, the lower gutter at the rear of the building is a smaller section – 5×4 rather than 6×4 – this is because the guttering is closer to the ground. 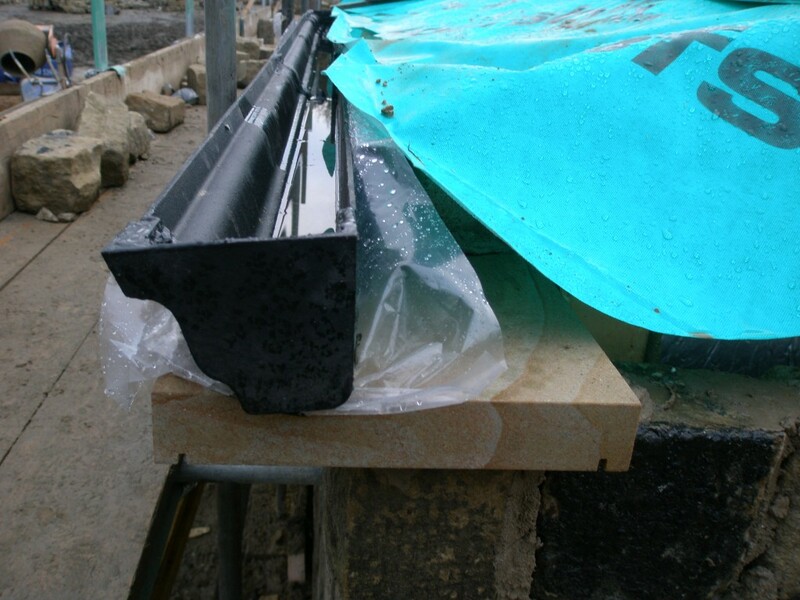 Lightweight plastic has been put underneath the gutters to protect the ashlar while the gutters are given their final coat of paint. Here you can see the new cast iron gutters sat on the ashlar shelf. You can see the groove cut underneath the shelf to stop the water from running back towards the building. The ashlar shelf has had to be core drilled to accomodate the rain water down pipe. We are making good progress on the walls in the sunken garden. There are terraces on two different levels, so there are plenty of walls here. The walls are built using reclaimed stone that we purchased. It is relatively flat and uniform so it makes pretty good walling stone. 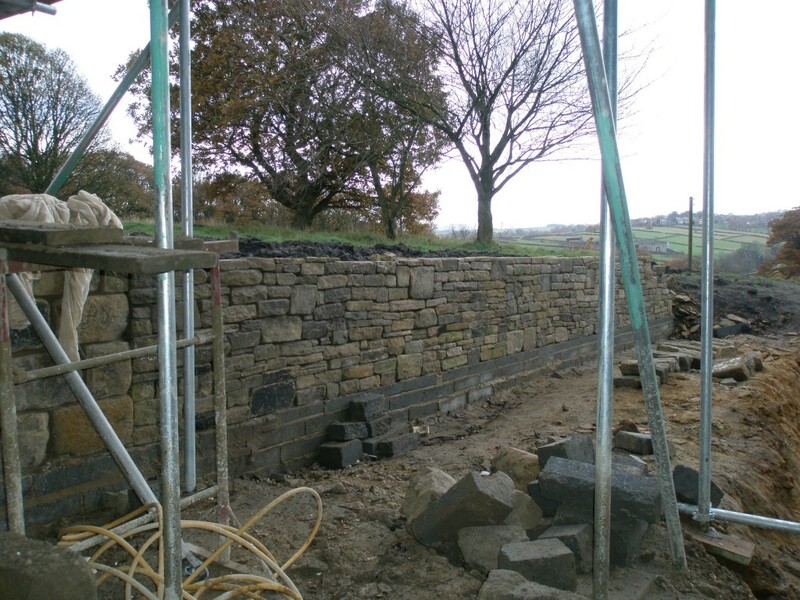 We have almost finished the wall on the upper terrace. 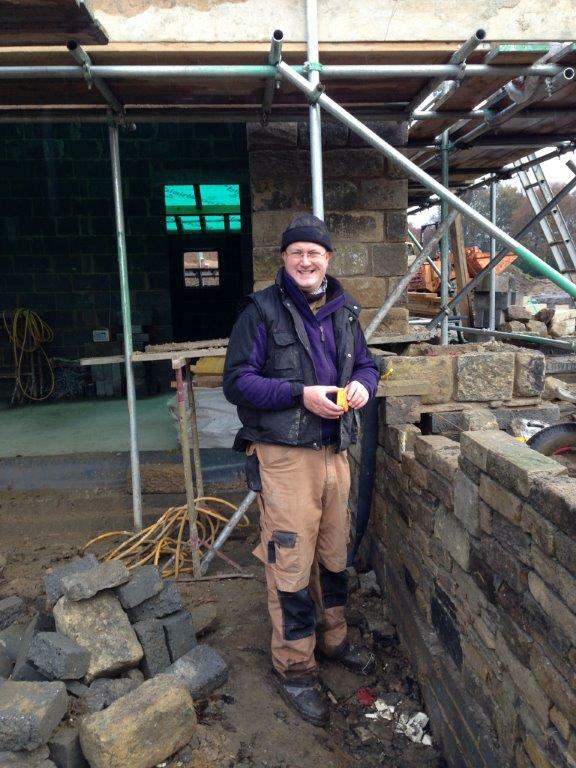 The coping stones are due to be delivered later this week, so it won’t be long before we get to see what the finished wall will look like. The top wall in the sunken garden is directly outside the master bedroom. This will be the view through the bi-folding doors (once they are fitted). The top wall in the sunken garden is nearing completion. We are expecting the coping stones sometime this week, so it will be good to see them go on. It was cold and wet and I was doing the best I could to put a brave face on the situation! In the other photos, I looked like Benny Hill!